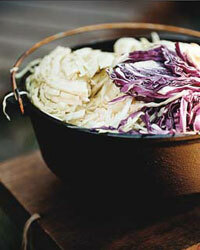 Put the shredded green and red cabbage in two large colanders and toss each with 1 teaspoon of salt. Let drain in the sink for 2 hours. Pat the cabbage dry. In a small, dry skillet, toast the caraway and celery seeds over moderately high heat until fragrant, about 20 seconds. Add the water and let cool. In a blender, combine the mayonnaise, cream, sugar, onion, garlic, vinegar, lemon juice, cayenne and black pepper. Pour in the caraway and celery seeds and their liquid; blend until the dressing is smooth. In a large bowl, combine the green and red cabbages, carrot, apple and parsley; toss with the dressing. Season with salt.